These units are designed for traditional digestions using serial flask heaters according tothe Kjeldahl method. Systems are available for 50-750 ml standard Kjeldahl flasks. All units are supplied with a very efficient glass exhaust manifold with funnel shaped adapters, which fit into the necks of the flasks. Micro Kjeldahl Nitrogen distillation Assembly, comprising of steam generation flask , steam trap , vacuum jacketed flasks with funnels, condensers tube of silver and receiving flask, complete with heavy duty stand, brass clamps but without burner. Advanced Technocracy Inc. is Manufacturer, Exporter & Supplier of Macro Kjeldhal Distillation Assembly. 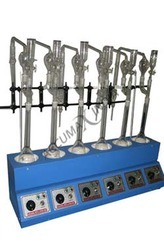 - Distillation Unit operable in Auto or Manual mode. - Programmable Logic Controller with built - in HMI. - Provision for storing two analysis programs simultaneously and can be recalled depends on the analysis routine. VELP Scientifica offers a complete package for Kjeldahl analysis, made up of a mineralization unit, aspiration and fume neutralization systems followed by distillation/titration units. - One single mild steel tubular stand is provided with two heating shelves, one above the other. - A fume duct holder and a heating box are supplied for digestion unit. - The heating units have individual on-off switches. - In upper portion another heating unit with a condenser rack is provided.